Description: The northbound Coast Starlight stopped at the Salem Amtrak Station. Description: The northbound Coast Starlight gets a clear signal as it pulls out of the Salem Station. Description: The northbound Coast Starlight arrives in Salem. 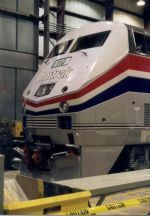 Description: Amtrak 500 is the third unit on the northbound Coast Starlight. Description: Northbound Amtrak at Emma Wood State Beach, close to Ventura, CA. Description: The southbound Coast Starlight arriving in Salem. Description: The southbound Coast Starlight is approaching the yard as it accelerates away from the station. Description: The eastbound Empire Builder just east of 8th Street. Description: The eastbound Empire Builder arriving in Vancouver. Description: Amtrak Coast Starlight #14 at Davidson St. at 16:04. I believe I see some crash damage (dent and missing paint) on the right side. Title: AMTK Coast Starlight and PNWR Albany Hauler. Description: If I had been at the cemetery (under those fir trees), I would have captured a shot showing the power on both trains. Description: Northbound Coast Starlight at 17:45. And a young foamer. Description: Southbound Coast Starlight #11 departs Albany at 16:14. Description: Amtrak's Coast Starlight #11 departs Albany towards signal 6907 on the Brooklyn Sub. Description: The westbound section of the Empire Builder makes a station stop in Wisconsin Dells, while the power idles on the bridge. Description: Amtrak #14 preparing to leave the station. Note the front- end damage on the 119. Title: Coast Starlight ready to roll? Description: The Amtrak Coast Starlight #11 arrives at Albany as the PNWR Albany Day Switcher crew moves the MPWPD power in Albany yard. Description: Amtrak 119 leads the Coast Starlight #11 past UP 7881 leading an intermodal to Seattle at MP 688.02, UP Brooklyn Sub. Description: The first westobund (compeass North) Tehachapi detour of 2008; made on BNSF trackage through the central valley. Train re-joined its usual route at Sacramento. Description: Actually, it was likely an engine failure in California. One of the P42s was refueled here, which would explain the tanker truck. Description: "Union Pacific train 14" accelerates slowly away from the station.